Seeing a Short-eared owl is a memorable sight. Sadly, breeding numbers are thought to have declined considerably in recent years – perhaps more so than many other predatory birds. We were keen to learn more. Staff from BTO Scotland have been studying the species since 2005, often in partnership with others (SNH, Tay Ringing Group, EURING). Much of this work has been done voluntarily, in staff members’ own time. ). john.calladine [at] bto.org (Please get in touch) if you can help us find the funding we need to carry out this work. The Short-eared Owl is largely nocturnal and crepuscular (dusk and dawn), but it is still one of the most active British owls during daylight3. However, despite this (and its charismatic appeal) current breeding numbers are poorly known. Surveys can reliably detect pairs that have successfully hatched young and are busy feeding their chicks but adults that have not nested or whose nests have failed can easily go unnoticed1. 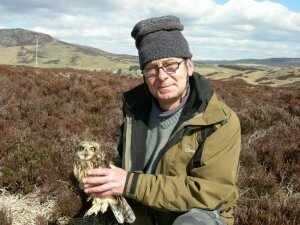 An estimate of the Scottish population suggested 780 - 2,700 breeding pairs (1,000 - 3,500 pairs for the UK in the late 90’s) although this is thought to be one the most unreliable estimates for any raptor or owl species7. A more recent estimate for Britain is 610 to 2,140 pairs – again, note the broad range9. Some experts consider the lower end of these ranges to be the more likely and are concerned that the species may have shown marked declines during the past two decades. Breeding numbers fluctuate markedly in response to prey availability(10, 13), however, and the birds are believed to range quite widely. These factors have doubtless added to the difficulty in assessing their breeding numbers and estimating population trends. Click here to read more about our work developing field methods for surveying and monitoring (subscription may be required). 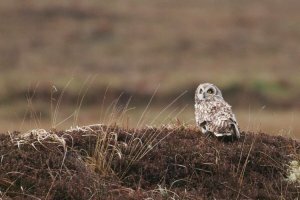 In Scotland, most of our breeding Short-eared Owls are found in moorland. The highest densities are found in areas of mixed rough grasslands and heather moors (marginal hill ground or ‘white moor’). A typical home range is around 200 hectares (~300 football pitches) and it seems that a variety of grassland types and heights within range is beneficial3. However, territory sizes vary considerably, ranging from 40 to 875 hectares (~56 to 1,200 football pitches)(3, 6, 8, 11, 12, 13). Young conifer plantations can also be important habitats(12), though second and later rotation plantings may be less frequently used. Lowland rough grassland, marshes and coastal sand dunes are also sometimes used for breeding though their use of these areas can be erratic (except on some of the western islands and Orkney). Elsewhere in Europe, breeding Short-eared Owls can sometimes be found in relatively intensive agricultural areas including cereal crops, meadows and rye grass fields. This difference probably reflects the availability of different prey to that found in Britain. Here they feed mostly on Short-tailed Field Voles. Interesting, they can adapt to life where these are absent or where alternative prey is available. On Orkney, for example, they feed predominantly on Common Voles4. Click here to read more about our work studying movement patterns and habitat use (subscription may be required). Neil Morrison with a female bird in the hand. Once the summer breeding season is over the owls tend to leave upland areas and are found mostly in marshes and coastal grasslands. Bird ringing recoveries suggest that a proportion of the birds seen on the east coast in autumn originate from Scandinavia5 with some remaining for the winter. Our British Short-eared Owls tend to migrate relatively short distances when compared to birds from Scandinavia and Central Europe. Nevertheless, ringed birds have been discovered from as far away as Russia, the Mediterranean and North Africa. The overall degree of connectivity between our breeding birds and those from elsewhere in Europe remains unclear. It would be an interesting area for further research. Our analysis of ringing recoveries from across Europe suggests that the distances moved between breeding and wintering areas generally increased from the early 20th century through to the 1970s, then subsequently declined. These changes may reflect changes in breeding population densities, at least in some areas2 (their populations grew during the 20th century but have declined since the 1970s). Click here to read more about our work on migration patterns. Calladine, J., Garner, G., Wernham, C. & Buxton, N. 2010. 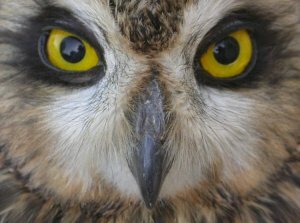 Variation in the diurnal activity of breeding Short-eared Owls Asio flammeus: implications for their survey and monitoring. Bird Study, 57, 89-99. Calladine, J., du Feu, C. & du Feu, R. 2012. 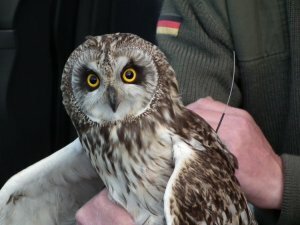 Changing migration patterns of the Short-eared Owl Asio flammeus in Europe: an analysis of ringing recoveries. Journal of Ornithology 153, 691-698. Calladine, J. & Morrison, N. 2013. Diurnal and nocturnal ranging behavioour by moorland breeding Short-eared Owls Asio flammeus in Scotland. Bird Study, 60, 44-51. Glue, D.E. 1977. 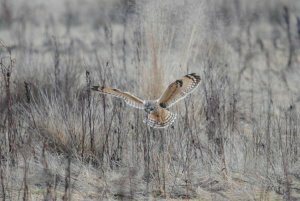 Feeding ecology of the Short-eared Owl in Britain and Ireland. Bird Study, 24, 70-78. Glue, D.E. 2002. Short-eared Owl. In Wernham, C.V., Toms, M.P., Marchant, J.H., Clark, J.A., Siriwardena, G.M. & Baillie, S.R. (eds) The Migration Atlas: movements of the birds of Britain and Ireland. T. & A.D. Poyser, London. Pp 437-440. Greenwood, J.J.D., Crick, H.Q.P. & Bainbridge, I.P. 2003. Numbers and international importance of raptors and owls in Britain and Ireland. In: D.B.A.Thompson et al, eds. Birds of Prey in a Changing Environment. Edinburgh, The Stationary Office. pp. 25-49. Locckie, J.D. 1955. The breeding habits and food of short-eared owls after a vole plague. Bird Study, 2, 53-69. Musgrove,A., Aebischer, N., Eaton, M., Hearn, R., Newson, S., Noble, D. Parsons, M., Risely, K. & Stroud, D. 2013. Population estimates of birds in Great Britain and the United Kingdom. British Birds, 106, 64-100. Petty, S.J., Lambin, X., Sherratt, T.N., Thomas, C.J., Mackinnon, J.L., Coles, C.F., Davison, M. & Little, B. 2000. Spatial synchrony in field vole Microtus agrestis abundance in a coniferous forest in northern England: the role of vole-eating raptors. Journal of Applied Ecology, 37, 136-147. Roberts , J.L. & Bowman, N. 1986. Diet and ecology of Short-eared Owls Asio flammeus breeding on heather moor. Bird Study, 33, 12-17. Shaw, G. 1995. Habitat selection by Short-eared Owls Asio flammeus in young coniferous forests. Bird Study, 42, 158-164. Village, A. 1987. Numbers, territory size and turnover of Short-eared Owls Asio flammeus in relation to vole abundance. Ornis Scandinavica, 18, 198-204.